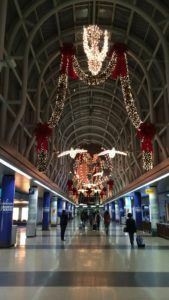 Ah, the holiday flying experience is almost upon us … long security lines, crowded gates, even more cramped seats, lost luggage… But wait, fly Delta and at least the last headache could be avoided. Part of Delta’s business model is to deliver passengers and belongings from origin to destination safely and smoothly. Delta manages these two inputs in separate channels; the goal is to have baggage travel in parallel to passengers. Focusing on baggage management, the objective is to manage passenger’s baggage from the drop at the check-in counter to baggage claim pick-up at the passenger’s final destination. Steps along this process include check-in, screening, sorting, loading, transfer, and arrival . Mismanagement at any of these stages can lead to bags getting on the wrong flight, being left behind, or lost. Potential factors contributing to mismanagement include number of bags checked per passenger, number of stops along the passenger’s route, and length of time between flights. US carriers reported an average baggage mishandling rate of 2.65 per 1,000 passengers while Delta came in below the average at 1.83 . These errors lead to direct costs to Delta in terms of logistics in locating the missing bag, getting the missing bag to the right city, and delivering the bag to the passenger’s doorstep. Mishandled luggage was reported to cost the airline industry $2.09 billion dollars in 2013 . Delta also incurs indirect expenses in terms of decreased customer satisfaction and tarnished reputation which ultimately leads to turnover in customers as they choose other airlines. In attempt to decrease costs and traveller dissatisfaction, Delta just implemented a Radio Frequency Identification (RFID) baggage tracking system globally this week after testing in pilot airports . In addition to the desire to improve operations and customer satisfaction, there is also regulatory pressure for implementing a tracking system to be compliant with the International Air Transport Association Resolution 752 requiring baggage tracking which will go into effect June 2018 [4,5]. Delta invested $50 Million in the program to create the infrastructure to support this system including a network of scanners and printers as well as alarms at belt loading . The primary reason for upgrading tags to include RFID is to address the inaccuracy of barcode readers leading to loading incorrect bags and missed opportunities to correct baggage en route. Signals from the RFID system are picked up by receivers successfully 99.85% of time compared to manual barcode scanners at 90% . An RFID chip is embedded in the paper luggage tag and scanners along the baggage route enable tracking of baggage location within and across airports. The slight increase in the cost of the baggage tag, now 10 cents versus 3 cents previously, are expected to be offset by the efficiency improvement in operations, decrease expenses compensating passengers, and increase in customer satisfaction . Delta’s ultimate goal is to reduce the number of mishandled bags to zero . With this system, Delta first expects fewer bags to be mishandled due to the baggage loading alarms, but if a bag is lost Delta can quickly identify the last known location which speeds locating and recovery of the baggage. Overall, Delta anticipates fewer disruptions searching for lost bags and decreased costs. With this new database of information, Delta can improve its baggage operating system by analyzing the data and identifying factors that contribute to higher instances of mishandled bags such as certain handoffs or segments in baggage travel, specific departing or arrival airports, or insufficient ground time during segments of flight. This new dataset is also a valuable asset that creates a competitive advantage for Delta since Delta will understand exactly where bags are getting lost, address systemic issues, and decrease the number of mishandled bags which will improve customer satisfaction. 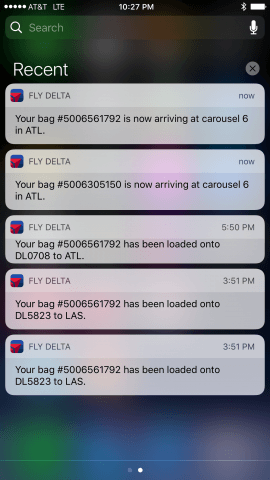 With the new system live this week, customers can receive push notifications to the Delta app regarding key location updates such as loading onto an aircraft and baggage claim carousel number . I anticipate after lost baggage, the next point of dissatisfaction for the customer would be damaged bags. Delta could potentially expand the application of the tracking system from lost to damaged bags with advanced sensors such as accelerometers that could further decrease cost and improve customer satisfaction. Delta could also use the new data to optimize for costs and possibility reduce “ground time” of planes. On the customer experience side, Delta could use this information to actually display passenger seat numbers when bags offload onto the baggage carousal in order to aid in baggage and passenger reunion. Tanvir Ahmed, Toon Calders, Torben Bach Pedersen, “Mining Risk Factors in RFID Baggage Tracking Data,” 15-18 June 2015, 2015 16th IEEE International Conference on Mobile Data Management (MDM), IEEE website [http://ieeexplore.ieee.org/stamp/stamp.jsp?arnumber=7264327], accessed November 2016. 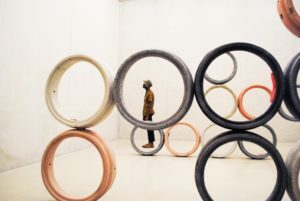 Martin Rivers. 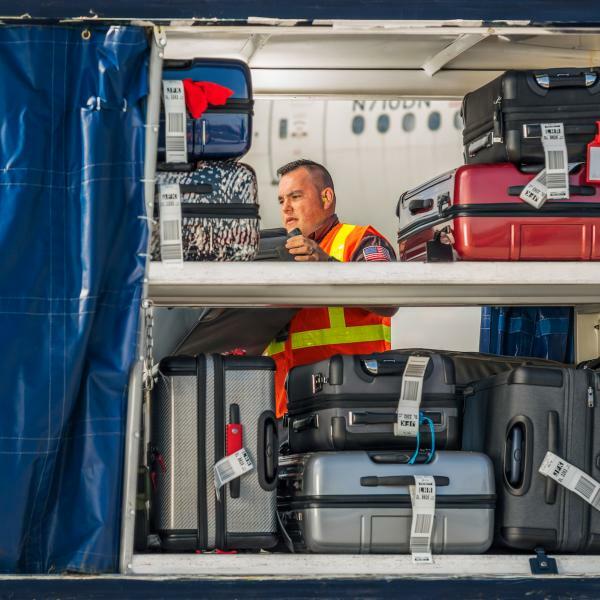 “Why Delta Air Lines Is Less Likely Than Its Rivals To Lose Your Bags,” Forbes, August 31, 2016, [http://www.forbes.com/sites/martinrivers/2016/08/31/delta-air-lines-promises-to-lose-fewer-bags-thanks-to-rfid-tech-rollout/#25b0feb33f76], accessed November 2016. “Fly Delta app push notifications take stress out of checking a bag,” press release, November 15, 2016, on Delta website, [http://news.delta.com/fly-delta-app-push-notifications-take-stress-out-checking-bag], accessed November 2016. 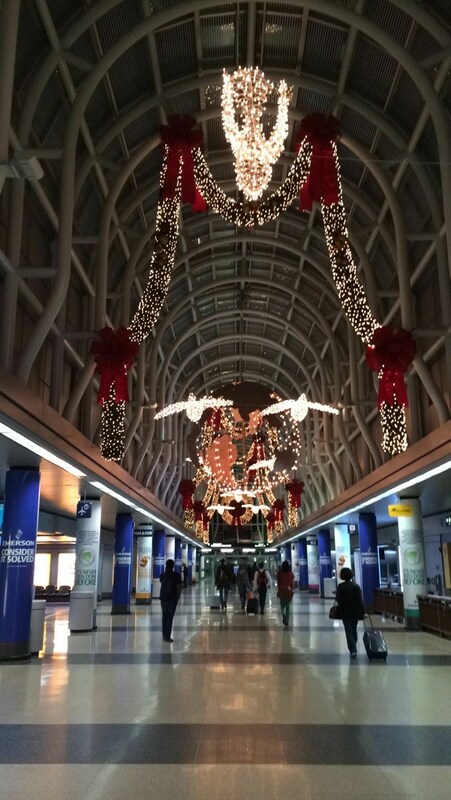 “Real-Time Tracking of Bags to Save Air Transport Industry $3 Billion,” press release, October 19, 2016, on IATA website, [http://www.iata.org/pressroom/pr/Pages/2016-10-19-01.aspx], accessed November 2016.
 International Air Transport Association, “Resolution 753: Baggage Tracking” (PDF File), downloaded from IATA website, [https://www.iata.org/whatwedo/stb/Documents/baggage-tracking-res753.pdf], accessed November 2016. Nikki Ekstein, “ Delta Promises It Will Never Lose Your Bags Again,” Travel+Leisure, May 5, 2016, [http://www.travelandleisure.com/travel-tips/airlines-airports/delta-will-never-lose-bags], accessed November 2016. While a step in the right direction, I am surprised bag management cannot be more automatized than this, and that they are relying on technology as simple as RFID to implement new changes. For example, are workers necessary at all in the act of loading/ unloading baggage or can that task soon be taken over by some kind of automatized process? I am hopeful, however, that this new data will lead airlines to identify root causes for baggage loss and eventually lead to a more efficient and error free process. This seems to be a step in the right direction, but the possibility of these tags getting ripped off the bag still exists. Qantas sells flyers RFID bag tags, which should save the airline on cost but at $23 may have a low uptake rate (http://www.latimes.com/business/la-fi-lost-luggage-delta-20160831-snap-story.html). I think that in the future almost all baggage will be sold with RFID tags inside, which prevents the risk of the tag being ripped off and saves the airline on cost. Maybe Delta could partner with luggage companies to make this transition faster. Separately, I am not sure the data set created by RFID will be much larger than the old tags. The baggage is still going through the same old system with checkpoints in the same places, the only difference being a higher likelihood of being correctly scanned. The data may be a little more precise, but in the old system Delta should still have been able to identify its main problem points and handoffs. I agree with you, CK, that the RFID “paper tags” are only a first step and that tags should become included into the luggage itself in the future to reduce the number of mishandled baggages further. Rimowa, a German high-end luggage manufacturer owned by LVMH, has taken up this trend and has equipped its newest collection of suitcases with digital baggage tags displayed on the outside (http://rimowa-electronictag.com). While the bag still does not include an RFID tag, I believe that Rimowa could quite quickly incorporate those into their collections. The only challenge I see is then is that close collaboration will probably be required between airlines and suitcase manufacturers to integrate their baggage tagging and tracking technologies. For now, Rimowa’s technology can for example only be used with the German airline Lufthansa. Thanks for sharing, ASP. I applaud Delta’s work on this front but would suggest individual airlines aren’t the best players to handle lost baggage. Digital transformation is certainly the key to lost luggage but airports may be in the best position to solve this problem. Individual airlines don’t seem to be the solutions for two reasons. First, the R&D and implementation of these programs are large commitments from a capital and time perspective. Instead, if one entity could take on this responsibility, we’d reduce duplicative efforts. (1) The second argument for an airport-wide system is the case of multiple legs operated by different carriers. Unless there is a global RFID tag that can be used across airlines, a bag will still need to be tagged in traditional ways if it needs to handled by another airline for a leg. (2) A uniform system across airlines may be the most efficient solution from both a time and capital perspective. It’s so great to hear that airlines are taking a step in the right direction to reduce the headache of checking bags for flights. What kind of broader effects do you think this will have on the turnaround time for airplanes entering and leaving airports? Does the new scanning system reduce the amount of time it takes for the bags to be loaded/ unloaded from the plane now that they do not each have to be scanned by their barcode? I love your idea for the baggage carousel to display passengers names or seat numbers once their bags are offloaded… It is so frustrating to fight with other passengers to grab your back after a flight! Perhaps the new technology can even send a push notification to the customer’s smartphone once their bag is ready for pickup. Furthermore, perhaps the technology could include a tracking device through the Delta app so customers can see where their bags are at all times, similar to how Uber customers can track their car before pick up and during the ride. Interesting article, and it is certainly great to hear that a few airline companies are starting their move to make baggage handling much more efficient. However, as many have voiced previously, I do feel that this should be an industry-wide endeavor. Not only would it save resources and enhance consistency to have all the carriers utilize the same RFID technology, it would also streamline operations and minimize customer dissatisfaction to have the buy in of all international airports. Too many times are luggage picked up by the wrong passenger, and the majority of the costs are still borne by the airlines. 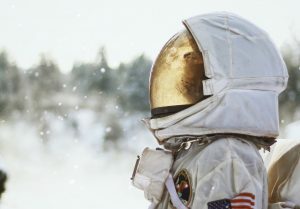 In an industry where players are constantly interacting with and whose success is highly dependent on one another, all parties need to be on the same page in terms of their digital transformation movement, in order for the end customer to truly benefit.